The alliance between the Democrats and their archenemy Berlusconi is another symptom of the country's deepening crisis. More than two months after general elections, Italy has a new government. The cabinet is headed by 46-year-old Enrico Letta, a competent and esteemed centre-left politician. A third of its members are women. It is supported by an alliance bringing together the centre-left Democrats, Berlusconi's centre-right People of Freedom and Monti's centrist formation Civic Choice. Financial markets greeted the news positively. At an auction on April 29, Italian debt was sold at the lowest cost since October 2010. EU political leaders and international observers also reacted favourably to what has been portrayed in the mainstream as a step in the right direction for a country in deep economic and financial crisis. Traditional party cadres, supported by the main Italian media, are spreading the mantra that this "broad coalition" is the only viable option to avoid systemic collapse. Letta undoubtedly knows how to speak to European leaders in good "technocratese" about fiscal restraint and structural reforms. He is soberly pushing for growth measures at EU level and promised that Italian families that are struggling will be helped. Yet, the general feeling outside the circles of political power is that Italians have been cheated once again. For all the hype around the new government, the political agenda is still dictated by Brussels. Nor does this cabinet have any more democratic legitimacy than the previous unelected one. Nearly 9 million Italians, about 25 percent of the valid votes, supported the anti-establishment 5 Star Movement, categorically opposed to any formal alliance with the old party system. In the lowest turnout in Republican history, more than 11 million registered voters - about 25 percent of all registered voters - stayed at home, forming the biggest "party" of these elections and signalling the increasing distance of the political system from common people. The electoral campaign of the Democratic Party (PD) centred around one unequivocal message: the party pledged not to enter in a post-electoral alliance with Berlusconi. Nine million people voted for them. Two months later, the party MPs blatantly ignored their electoral promise and supported the broad coalition government. 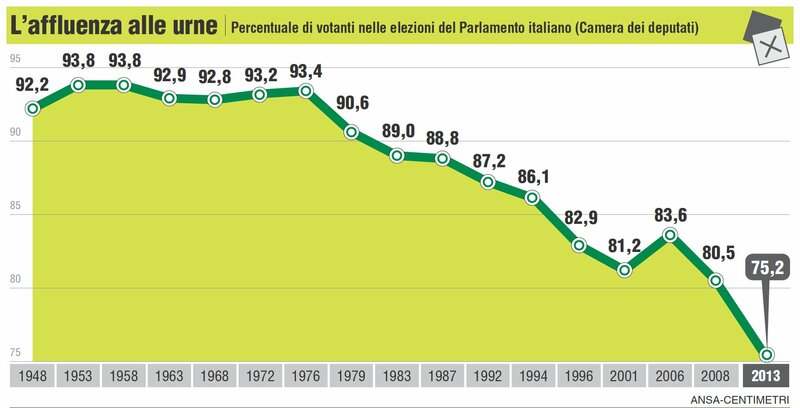 If we add the votes of Left, Ecology and Freedom - also openly against an alliance with Berlusconi - more than 30 million Italians, out of 47 million registered voters, are not represented by the current government. This alarming state of affairs highlights the deep crisis of Italian democracy. Doubts over the new government are not confined to questions of democratic representation. Is Letta's cabinet fit for purpose? Is it the right answer to the country's deepening crisis? The Democrats, who are leading this uneasy alliance and are the biggest party in parliament, are on the verge of disintegration. On April 20, the presidential vote culminated in Giorgio Napolitano's unprecedented re-election. He is the only President in the history of the Republic to hold office for a second term. Napolitano's re-appointment was a last minute compromise to break the political impasse caused by the dramatic divisions within the PD ranks. After announcing formal support for senior PD official Franco Marini in agreement with the centre-right, Democrat MPs failed to mobilise around him. In another voting session, more than 100 defectors sunk the candidacy of party founding father and twice premier Romano Prodi. Following this debacle, the party secretary Pier Luigi Bersani resigned. PD entered the final round of government negotiations without a leader. It has also been facing an open revolt from the rank and file. In the last days Occupy PD, a permanent national assembly to reform the party from the grassroots, has spread virally, widening the rift between the electoral base and the party cadres. Militants are occupying party branches throughout Italy and staging protests against the party establishment. Party MPs' "strategic withdrawal" into a coalition with the archenemy will buy some precious time to recoup and let the internal dramas escalate before a new deal is reached. This means that the party cannot guarantee unity within its ranks in future parliamentary votes, fuelling uncertainty over the fate of the broad coalition. On the other side of the alliance, Berlusconi's regained strength conceals more than it reveals. With numerous trials pending, the tycoon is surely benefitting from Napolitano's protection. The President recently warned the judiciary against a "legal solution" that might prevent the former premier from performing his political role as party leader. Berlusconi's active involvement in government makes this option even less viable, given the potentially destabilising consequences of a "forcible removal" from frontline politics. While Berlusconi might be afforded some respite from his problems with the justice system, in the last months his electoral support has been volatile. After a spectacular comeback in the last elections, Berlusconi needs to show his electorate that he means business. He promised the abolition of a much hated tax on residential homes and a complete refund of its previous payments. The tax was introduced by Monti's cabinet as part of its austerity package. On Tuesday, following the new Prime Minister's less ambitious undertaking to suspend the next payment due in June and to review the levy, Berlusconi threatened to withdraw his support if the government will not deliver on his electoral stunt. This happened on the same day the government received the final vote of confidence by the upper house, further highlighting the inherent fragility of the alliance. But what else did Enrico Letta announce in his programmatic speech to the parliament last Monday? The European technocratic agenda remains the main priority: structural reforms and tight controls over the budget deficit. At the same time, Letta promised to help Italian families, vaguely hinting at measures that will reduce the tax burden, provide a limited form of basic income to a small sector of the population, and extend the duration of the unemployment benefits for recently dismissed workers in protected categories. In other words, business as usual, except for some modest measures to alleviate the worst effects of Monti's austerity. The lack of detail in Letta's proposals was a clear indication that the government alliance does not have a concrete plan of action - at least not yet. Despite the political makeover, there is a strong continuity between the new and the previous government. Following Berlusconi's resignation from premiership in November 2011, the centre-left and centre-right coalitions agreed to support an unelected technocratic government. Monti and his cabinet would take care of the economy. The political parties would work together to implement the necessary institutional reforms to make the political system more stable and responsive to the current environment. By the time new elections were announced in December 2012, the parliament had yet to approve any institutional reform. MPs also failed to modify an absurd electoral law pushed by Berlusconi in 2005. If the winning coalition tops the polls by a narrow margin, the current system makes it virtually impossible for the winners to secure an absolute majority in parliament. The latter is needed to form an autonomous and stable government. This is exactly what happened in February this year. It is unlikely that after a year and half of legislative standstill, Berlusconi and the Democrats will be able to work together on a shared agenda of reforms. There is a serious risk that in the next general elections Italians will vote without an electoral law that guarantees a clear winner and a lasting government. There is no shortage of painful reminders that real change cannot be postponed further. On Sunday, an unemployed man shot two police officers outside the Prime Minister's residence while the new cabinet was being sworn in. The intention was to make a strong statement about the desperate situation of many ordinary Italians. On April 10, a wildcat strike among transport workers in Rome and a revolt of small shop owners and unemployed people in Naples aptly symbolised the widespread mood of helplessness and frustration. Meanwhile, the 5 Star Movement continues to advance in opinion polls, rallying popular support for a radical overhaul of the current political order. As the old guard keeps on stalling in self-defence, 5 Star Movement's chances of dealing the final blow to a moribund party system are on the rise. Vito Laterza recently completed his PhD in Social Anthropology at the University of Cambridge and is currently a Research Fellow at the University of the West of England. His research focuses on political, economic and socio-cultural issues in Africa and the West, from a global geopolitical perspective. Vito Laterza is an anthropologist and political analyst focusing on politics, economy and society in sub-Saharan Africa.